When we were crossing the Pyrenees Javi started having a little pain in his leg, but as those were hard cycling days, we only thought that it was because he was not used to this much effort. Unfortunately we were not entirely right. They day after we slept in a schools yard (­­after the huge storm), it was nice and sunny, and the way ahead of us was quite flat. But suddenly Javi started going slower, saying that his leg was giving him trouble. We tried to continue, but when we arrived to Ossun, about 30km from where we started, he got off the bike, and said that he could not continue. Walking we got to the center of the town, where at the entrance of a school there was a big bus stop with lots of shadow. There we decided to rest for a few hours, have lunch and prepare the first week’s summary video. The day was passing by, and as the video was getting ready, Javi’s leg didn’t seem to improve. 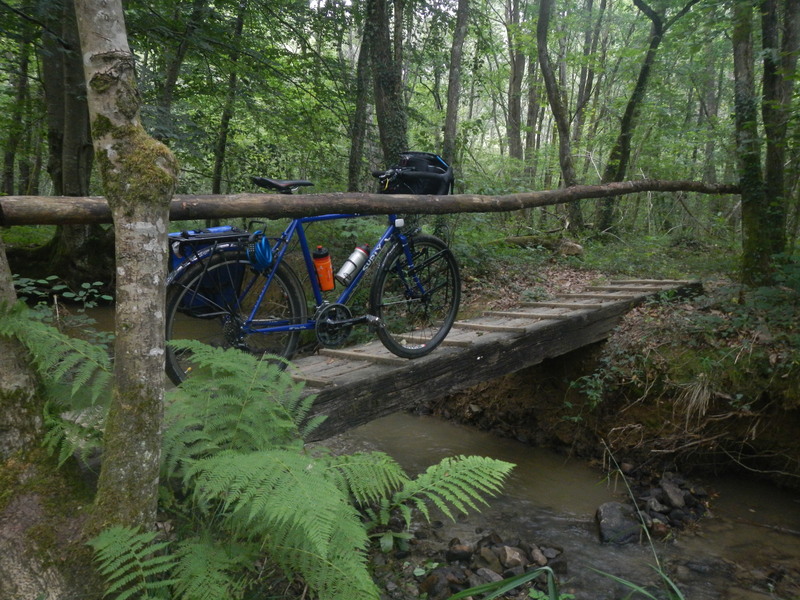 Luckily a nun passing through there stopped and, curious about our bikes with luggage, asked where we were going. After explaining her the whole story she offered us a place to stay, if we still needed it in the evening. When the evening arrived, we were still there. Javi could not cycle anymore, so we had seen the town, and tried to learn the rules of petanque by watching some locals play it. We are still not sure about every single detail, but we got the general idea. Monica, the really nice smiley nun, as promised, took us to a room with a few mattresses, and told us that we could stay there as long as long as we needed. The place was amazing, with a shower and a little kitchen. Thanks Monica! The next day when we woke up it was clear that we were going to stay one more day, as Javi was still not in shape of continuing. At that moment we considered going to a doctor, but we thought that it was not needed. Javi stayed in the town, and Goiznabar and I went to Lourdes, as it was quite close. We followed a route that Monica told us, quite nice at the beginning with the Pyrenees as a background, but we got lost, and it took us more than two hours to get there. The way back we followed the railroad, and returned in only 20 minutes. The next morning Javi was feeling better, so we decided to continue towards Tarbes, where we tried to find a little piece of the cooker that was loose for a few days. We were there too long and couldn’t manage to find what we wanted. So in the middle of a storm, we left the city. About 15 km on the way to Toulouse Javi could not keep going. Then it was clear that he needed to see a doctor. So the next day he went back to Tarbes and took a train to Toulouse, while Goiznabar and me did the 140 km by bike. The way was quite nice and flat, so we could cover most of the distance by lunch time. We ate at Lombez, in front of the nice cathedral, and while Goiznabar took a siesta, I visited it. It’s a really interesting building, with lots of mixtures of different styles. We continued, and by mid afternoon we were already with Javi in Toulouse, who told us that we had to wait a couple days in the city because they still needed to do an ultrasonography, to check how big his hamstring was. It was getting late, and all the warmshowers we tried to contact did not answer, so we had no clue where to sleep. But I saw a chance that I could not miss. Leaving a house was a man with sports clothes, so without any hesitation I asked if we could camp for one night in his garden. He told me to ask his wife, because he had to leave. I went to talk to her, and it turned out that she was from Catalunya, really nice, and she said that there was no problem. So that’s the story of how we ended up squatting the garden of a really nice family, waiting for Javi’s doctor appointment, to see how long we had to rest before we could continue our trip. We are still close from home, but we are already changing our mentalities. We are starting realize that even if there are problems we are not going to turn around, we will succed!